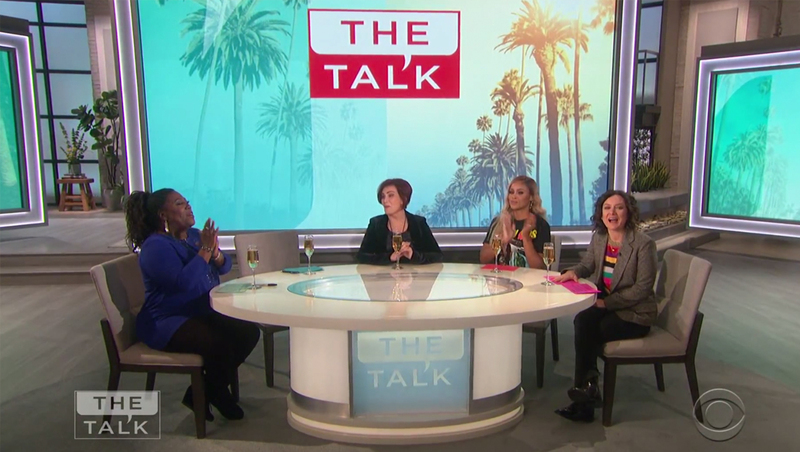 CBS’s daytime talker “The Talk” updated a key part of its set when Carrie Ann Inaba took over Julie Chen’s spot on the show earlier this year. The show’s large dining room-style wooden table was swapped out over the holiday hiatus for a more “anchor desk” style piece. The oval table is no longer open on the front, with a base created using backlit glass with a frosted “The Talk” logo in the center front. The new table also boasts new chairs and chin fills. The table made its debut Wednesday, Jan. 2, 2019, when the show returned from a holiday break. The open that day did not include Inaba, but she was officially introduced at the top of the show. On Thursday, the show’s open was updated to include Inaba, but notably changed the order of the hosts to alphabetical by last name (with the exception of Eve Jihan Jeffers-Cooper, whose stage name “Eve” places her first). This new arrangement moves creator and executive producer Sara Gilbert second, with Inaba following her before rounding out with Sharon Osbourne and Sheryl Underwood’s cards. In addition to the open, the large cast photos on the two suspended video walls, including the one that rises to allow the hosts to enter, were changed out beginning Thursday. Inaba essentially replaces Julie Chen, who served as the show’s moderator — but Gilbert has taken over Chen’s position at the table — with Inaba typically sitting second from the left, between Underwood and Osbourne. Inaba also typically does the voiceover on the show’s teases, a duty Chen previously performed, but Gilbert normally opens the show and introduces any guest co-hosts.